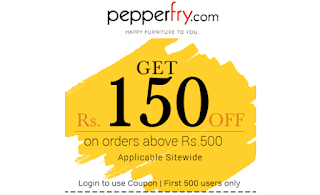 Pepperfry Has Come Up With EID Offer where they are Offering Flat Rs 150 Off On Purchase Above Rs 500 For first 500 users only. -> Offer is Valid For All Users. Follow Below Steps To Avail Coupon.